Goucher ... Torres ... Ritz ... And Vaughn?! "I can't really put it into words. I'm going to have a hard time sleeping tonight." 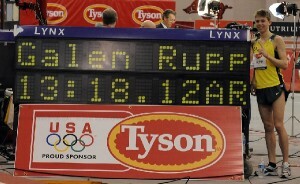 - Former CU Buff Brent Vaughn, after winning the 2011 USATF NCAA XC Championships convincingly. Vaughn may have been the 5k record holder at CU, but until Saturday, he did not have a national title to go along with it. Russell Brown Cruises To 3:54 Win, Webb, Manzano And Verzbicas All Over 4 The men's mile featured Alan Webb, Leo Manzano, Nick Willis and high school star Lukas Verzbicas, but the star of the night was Russell Brown, who crushed the field winning in 3:54 as Webb, Manzano and Verzbicas all didn't break 4. Afterwards, Webb threw a tantrum (seriously, that's a fair way of describing it) before addressing the press, and we'll have more on that Sunday. In other action, Sally Kipyego turned back Jenny Barringer in the 3k, Phoebe Wright got another win in the 800m, but the performance of the night may have been Dejen Gebremeskel running 7:35 and outkicking Mo Farah with a last lap of 26 while having one shoe on for most of the race. Alberto Salazar Thinks Webb Will Run Well But Is More Pleased He's Learning To Get Out From Under "Pressure Cooker"
Boston Herald: Recovered From Flu, Alan Webb Is "Super Hungry"
Brent Vaughn Wins Convincingly; Shalane Flanagan And The Other Winners Dominate Vaughn, the CU record holder at 5k (think about that for a second) dominated the field the 2nd half of the race to win by 6 seconds, the smallest margin of victory of the day. Shalane Flanagan totally destroyed Molly Huddle, winning by 44 seconds, and getting a little revenge for Huddle taking her 5k American record last year. Foot Locker champ Aisling Cuffe won the junior girls race convincingly. 49-year-old Master Pete Magill won in the men's masters ranks, while Colleen De Reuck showed she was in the wrong race, winning by 1:34. *San Diego Union-Tribune: Flangan Dominated But Says She Didn't Know She Had It In The Bag, "I always run scared." 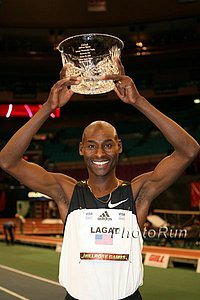 IAAF: Beppu-Oita Marathon Preview Top runners from will include Samson Ramadhani, the 2006 Commonwealth Games Marathon champion with a best of 2:08:01, Ethiopian Abiyote Guta, with a career best of 2:09:03, and Moroccan Ahmed Baday, a 2:10:58 runner.